Makes parking easy. Designed to guide you into your garage and let you know exactly when to stop. As you feel your vehicle go over the first speed bump, you know it's time to stop. If you feel the second speed bump, you know not to go any further. The ParkingSpot comes with high performance self adhesive tape on back side for easy mounting to your garage floor and features heavy-duty all aluminum construction. 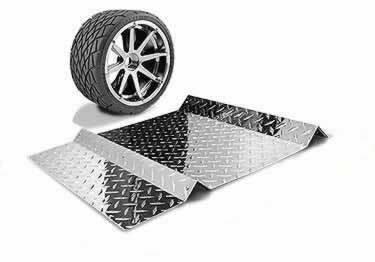 Perfect for cars, trucks, SUVs and even motorcycles. Constructed of aircraft grade aluminum tubing and real commercial grade aluminum diamond plate, the ParkingSpot is built for heavy-duty use. Works with all cars, trucks, SUVs and even motorcycles. Great for garages to prevent wall damage. Do I need two per car or one? The ParkingSpot, is designed to guide you into your garage and let you know exactly when to stop. Works with all cars, trucks, SUVs and even motorcycles. I have three of these. 2 of them were 5 years old and just need to have their rubber feet replaced, but I decided to purchase 2 new ones. I had just bought a new bigger one that arrived undamaged, but the these last two both has corners bent. One was easily repaired but the other severely bent in the front corner and the front was warped on that side. The box was undamaged in any way, so I don't how it would have happend. I was able to bend and straighten the corners and then using the weight of the SUV to straighten the warped area. This is the first time this happend in the 2012 purchase and with the 3 I bought recently so it should not prevent one ordering the is product as it does work better than any other and the 5 year old ones only problem was the rubber feet which are different than the ones they use now, became compressed and would allow the stops to slide. Thank you for your review. Please keep in mind if this ever happens again please let us know and we will ship you out a replacements, no questions asked. You put it on the floor and drive your car over it. Very sturdy. It doesn't break like the cheaper plastic ones. What else can I say...!! These are much better than the cheap plastic ones sold elsewhere. Very durable and they look nice on my new epxoxy floor. Work better for larger SUVs and trucks. I would suggest painting the steel re-enforcements on the bottom. I had a plastic parking spot marker previously and it would never stick to the floor and eventually broke in half. This new metal one is the perfect solution. Heavy duty, wide construction and no perforations for water to get under it from wet tires. I was especially impressed with the adhesive tape that covers almost the entire bottom. This thing isnt going anywhere. Alows us to park in same spot everytime. Great product!